Skinnies continue to rule the world because they fit every body type as long as there is a stretch component in the fabric. 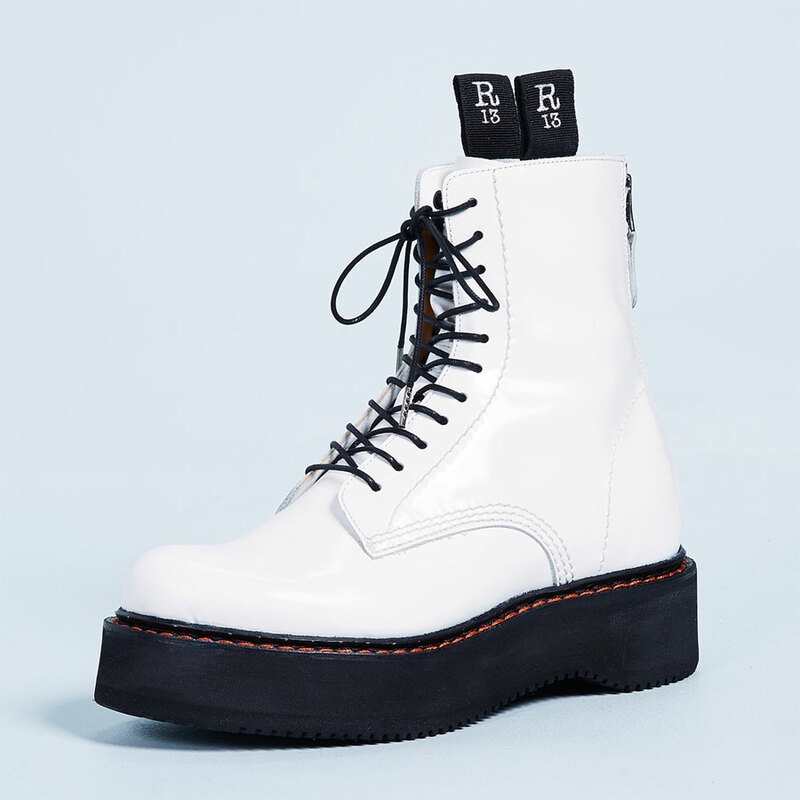 They are also the easiest and most practical silhouette to pair with comfortable shoes, like casual flats, boots or sneakers. Wearing cropped skinny jeans in Summer makes perfect sense when the weather is mild, when temperatures cool down at night, when you work in air conditioning, or when you run cold. That’s why I’ve collected four easy casual looks without heels. It’s been hard to find examples of outfits without tucked or semi-tucked tops, but feel free to keep tops untucked if that’s more your thing. 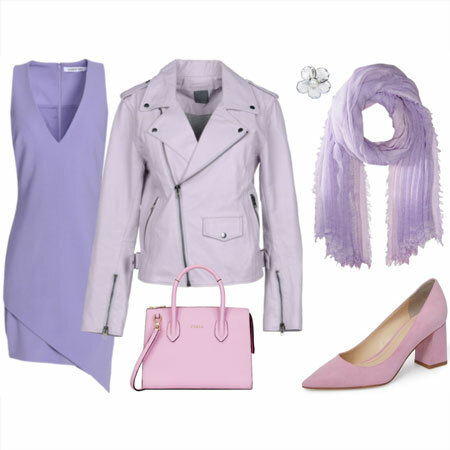 Combine skinnies with a dressy sleeveless blouse and layer a fluid cardigan over the top. Finish off the look with dressy loafers, mules, ballet flats, baby wedges or sandals, and a structured bag like a satchel, tote or clutch. Choose any colour palette. Here, I love how the black loafer bookends the model’s hair and picks up the colour of the blouse. The high neckline and bow work on a larger bust because of the model’s long neck. Smashing look. This vibe is dead simple and very comfy. 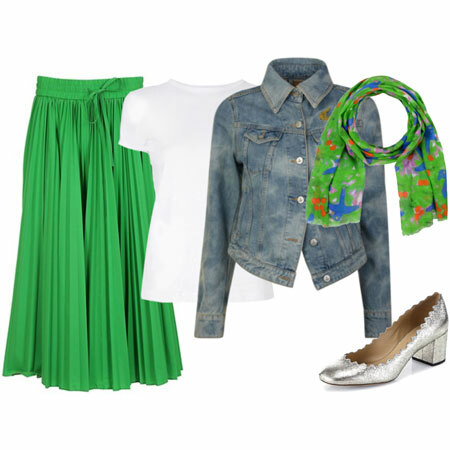 Combine a soft, billowing blouse with a pair of skinnies in any colour palette. It’s important that the blouse is fluid or oversized to contrast with the skinnies. The skinnies add structure to the outfit, as does showing bits of forearm and part of the foot. 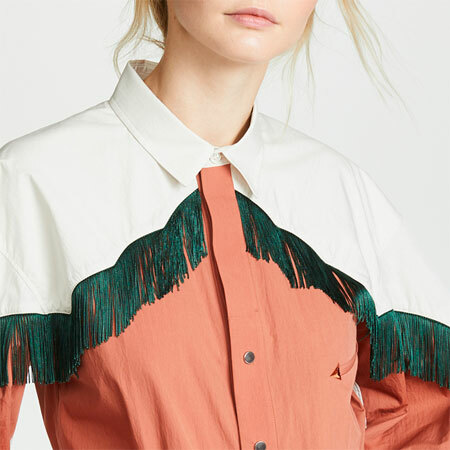 Wear the blouse semi-tucked or untucked. Add flat slides, mules, sandals, d’Orsay flats, loafers, espadrilles, or ankle strap flats. Apart from the trendy slides, all of the items in this outfit are a trendier version of a classic. 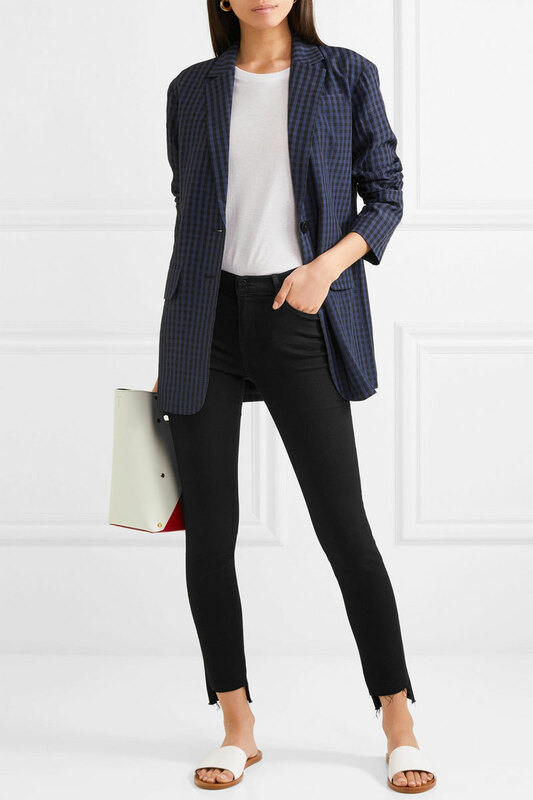 Combine skinnies with a tee and blazer in any colour palette. Semi-tuck or untuck the top. Here the tucked top lengthens the leg line from the hips upward, which tempers the length of the long blazer that shortens the leg line. Add trendy slides if you like, or any other comfy flat. Personally, I like how the white tee, shoes and bag lighten the outfit, add a crisp touch, and make it pop. 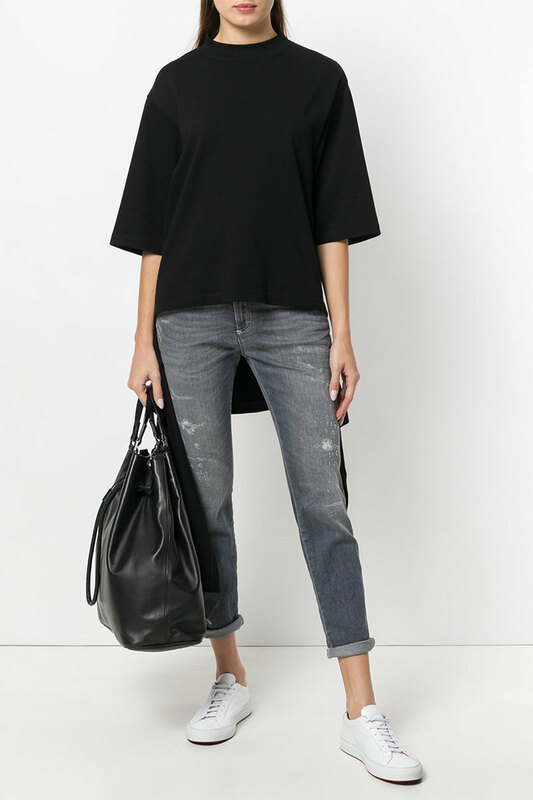 Combine cropped skinnies with an oversized knitted top like a sweatshirt or the like. Finish off the look with sneakers and a statement bag. Stick to black and grey if you want to keep the vibe moody. I like the addition of the white sneakers but you might prefer grey, silver or black. Add jewellery, watch and eyewear as desired. I have been playing around with wide leg, but skinny remains my default. It’s just too easy! Just want to say how much I LOVE these formula & ensemble posts! Love all of these, have worn something like #1 often. Just got some simple off-white sneaks so looking forward to trying something like #4. I’d wear #2 today, with the billowing blouse, if it was in my closet. The cognac, blue and white scream summer! This is pretty much my signature look : skinnies + flats + a top of sorts. Super easy and comfy. Thanks for the new inspirational options, I must try tucking a soft billowing blouse to mix the look up a bit. All four ideas are fun. I’ve been wearing variations of the first one a lot and am still enjoying the silhouette very much (I do a straight leg instead of a skinny, but they look quite similar on me anyway). I love these outfit formula posts, too. And there’s no getting around it: skinnies are here to stay. I still find them a fantastic fall back. I like all of these ideas and will happily wear them when our heat wave ends. But for now, I’m milking the dress season and the warm temps! I love these looks. It took me a while to warm up to skinnies but now it’s hard to see why. They are the easiest for flattery and proportion. I do versions of #1 the most but like them all. Beautiful, but I have yet to find a pair of skinnies I like on me and find comfortable. Straight legs all the way for me! With a rare exception or two, my skinnies live in the closet until later in the year. I’m sweating just looking at this. These are all fall outfits for me! I also enjoy these posts. They clarify outfit composition and push me to experiment. I have found new ways to put things I already own together. I love skinny and straight leg jeans. I use three of these formulas regularly – smart casual, trendy casual, and romantic comfort. I don’t wear black, so I am least likely to wear moody graphic looks and I’m not sure if any of my clothes really count as being moody? I would call my look joyful graphic or happy graphic instead! I find it too hot and more importantly too deathly humid here in the summer to wear my skinnies so these are more like spring/fall outfits for me. I rarely wear jeans at all in the summer and even when I do (like when we go to the mountains) it’s the looser lighter pairs like my bfs or crop flares. I’m with Janet and Diana about this not working for my summers. Like Inge, a straight leg jean is my version of this. I like the moody graphic, with the statement sweater, but like Staysfit, would do this silhouette in brighter colors. This remains my standard way of dressing. Volume and width in jeans just does nothing for me, and I find skinnies ultimately easier to style and more flattering (at least I hope they are) on me. There’s nothing trendy about them, but I’m absolutely ok with that as it’s easy to modernize the look with other pieces ,as you’ve shown here. Love the pops of white with these outfits too. I have tried to vary jean silhouettes but skinny and straight jeans still have an important place. #3, the trendy classic, appeals the most. Jeans are an almost daily outfit piece for me, so it is fun to experiment with some new ways to create outfits with them. 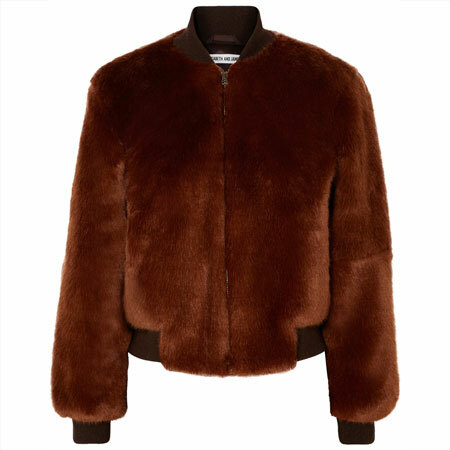 This time of year the jackets are seldom needed and often even cropped jeans are just too warm. Great outfit formula, I like all, but especially #2 . Unfortunately I can’t wear that in summer, too hot for jeans, but in September it would be super. I’ve been enjoying mostly cropped and cropped flares this summer, and I tend to sub slim straights for true skinnies! I’m loving slide shoes, and am eyeballing a slide boogie from NAS! I’ve also put a boyfriend blazer on my fall shopping list after editing 11 years of photos. I had one until a few years ago, and I realized it was flattering and versatile, and the silhouette looks fresh to me again. Its way to hot to wear skinny jeans here in the summer, but they all are great fall looks. I really like the first one for fall. I very much appreciate this post, Angie. Since skinnies are ubiquitous, it’s easy to take them for granted. Freshening, or “upping” the style, makes them feel fresh all over again. I’m so glad to see this post. I run cold and will wear skinnies even in 100+ F temps, especially if I know arctic AC will be involved. Hi, I’d like to say something about how quickly the eye adjusts. I read this post and a post on another site this morning and did not mentally sort it into regular and plus size offerings, I just looked at the styling. Keep it up, and we’ll all feel better about ourselves. Thanks! Lovely! I was just contemplating what to wear to the symphony on Sunday afternoon. The first formula looks perfect! Oh, how the right skinnies (or straights) can make a wardrobe function. I love the way one can mix in more or less structure to totally change the mood. Definitely a great casual, yet deliberate approach to daily dressing. Great examples. Yes, I believe skinnies are supremely functional. Love all these tops. Have never really liked skinnies, at least not on myself, but your mentioning of stretch is important to me. Stretch is probably a key factor to make skinnies work for me. And when I think about it, my narrow stretchy white jeans (which I have come to love and have worn a lot the past months!) could possibly pass for skinnies. YES. Skinnies are forever fabulous. I love them with you, as long as they aren’t too tight. YES. Straight legs can be your skinnies. Cat, there you go. Let’s hope that happens in stores too. Skinny jeans work for me year round where I live, mild weather in winter and air conditioning in the summer. I wear all of these options but my favorite is #3. I also love the way the white top and slides work with the dark outfit. I like the Outfit Formula posts a lot. My skinnies are more like straights. I love these looks but it is way too hot to wear them right now. I will keep them in mind for cooler weather. Love the looks and agree that the footwear makes for great outfits! I love this formula and especially the trendy classic and smart casual looks. I added some white Anne Klein Harmonie loafers to my wardrobe after buying them in navy and they really do brighten an outfit. What do they call that hem cut in the trendy classic photo? I saw a woman at the airport over a year ago with some jeans like that and I’m not sure if they were called “LA” or something else. I found them interesting at the time and still do yet I probably wouldn’t buy them. Still, I do like the look. Great ideas here, thanks Angie! I have to start a thread about lightweight skinnies now, a HEWI for me. Formula skinny jeans works for me. I like all of the looks you posted. Along the coast we usually have cooler temps and skinnies are great for cool or gray days and just about any evening. I really like wearing skinnies with sleeveless blouses and sandals. Never say never, but I find it very hard to wear skinnies in my long and warm summers. I can wear jeans in summer, but mostly straight legs, and now I am wearing a pair of cropped denim wide legs a lot. I like all 4 renditions here and would happily wear them in the fall or in a warm winter day, not for summer though, so far, but you never know. It’s too hot here to wear jeans at the moment so skinnies will be a spring /autumn option. I like the blue & black blazer. What is it? All four outfits look comfortable and easy to wear. As a plus size gal (14/16 or 18/20), it took me a while to conger up the courage to wear skinnies. I finally figured out that I needed to find the right fit. Slim straight jeans fit the bill of a skinny look for by full calves with high volume feet- and I love them. Great post, Angie! As a plus size gal (14/16 or 18/20), it took me a while to conjure up the courage to wear skinnies. I finally figured out that I needed to find the right fit. Slim straight jeans fit the bill of a skinny look for by full calves with high volume feet- and I love them. Great post, Angie! I would love to wear 2 or 4 – I am moody! I am wearing 3 today and really enjoyed it (it is winter though). Calf fit is the key for me to make skinnies work along with the right proportions on the top. I don’t usually tuck into skinnies but enjoy a shorter top sometimes – especially when wearing a jacket. I think the 80s gal in me will require I always have some skinnies in my wardrobe ^^ We definitely get plenty of mild-enough weather for summer skinnies, though the past two summers I have been feeling cropped straights over skinnies for warmer weather. #1 (smart casual) and more recently #2 (romantic comfort) have been getting plenty of wears though! #4 (moody graphic) also gets worn but not in moody colors #3 (trendy classic) was an older fave which I haven’t worn nearly as much the past two+ years.